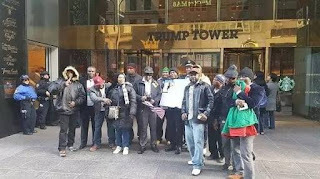 In solidarity protest of their detained leader, Mazi Nnamdi Kanu, The Director Radio Biafra, The Indigenous People of Biafra (IPOB) members in the United States have paid the US president elect, Donald Trump a visit in his home (Trump towers) during the weekend to show him support. 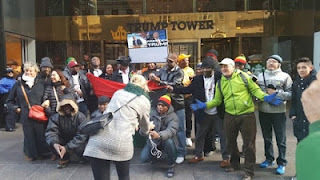 On the visit, IPOB members raised an awareness to the plight of their leader, Mazi Nnamdi Kanu, who has been in detention since 2015 over alleges treasonable felony against the Nigerian government. 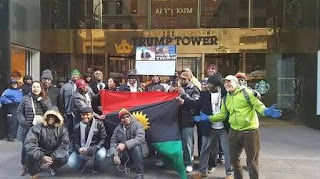 They also kicked off the ‘Biafra For Trump Solidarity Rally’ to announce Biafrans unwavering support towards the Real-estate mogul as he is set to be sworn in as the 45th President of the United states of America soon.